IT IS URGENT TO MAKE BETTER KNOWN THE PEACEMAKERS OF THE WORLD! This state of emergency has never been more newsworthy. We’ve been hearing about the so-called “holy war” in the Middle East that is attracting thousands of youths to Iraq and Syria. A war with killings and decapitations leaving thousands of good-willed women and children helpless and homeless. A war that deprives of water entire populations, including the sick and the elderly. This destruction has become daily headline news. Shouldn’t we also bring forward through the media, the countless adults, teenagers and youngsters who are building bridges for peace? Shouldn’t these new heroes be recognized? The Public Peace Prize is designed to help everyone discover these invaluable peace builders. You may not be aware that there are peace caravans in post-genocide Rwanda, in the Democratic Republic of the Congo and particularly in the Kisangani region. These caravans are also present all over Peru, capital cities and jungle included, in Haiti, in the Syrian refugee camps of the Bekaa Valley, in Lebanon, in Syria, in Egypt. And there are more. A large-scale peace project only requires that one decision comes into being. Of course, we need to identify where and how peace can be achieved; and yet, we are linked, each and every one of us, to help find these peacemakers. Children around the world need guidance, and teenagers need mentors and role models for how to build peace. Let’s discover and share them! These awe-inspiring people are real men and women, young and elderly, working at uniting instead of dividing and excluding. These people consider others as people, regardless of their differences. They’re unveiling a new world where prejudice is not the norm. Ways and means must be learned and lived in order to return to conflict zones with peace as the sole objective. People don’t magically become Peacemakers; they have to learn, step by step, by learning to use the right tools. The key ingredient to becoming a peacemaker is to seek out and discover our fellow human beings, even if he or she is a difficult neighbour. Learning about the “other” is the means to see beyond our frustrations in order to identify any possible common experience that makes communication possible… but discovering what makes others tick may very well require dealing with our own demons too. How many Peacemakers can we find throughout the World? In each country? In each city? What would happen if these individuals themselves were to come forward? What if they were to publicize their peace initiatives and if those initiatives were shared in every possible way? Becoming a Peacemaker is absolutely possible. These two anecdotes may convince you. 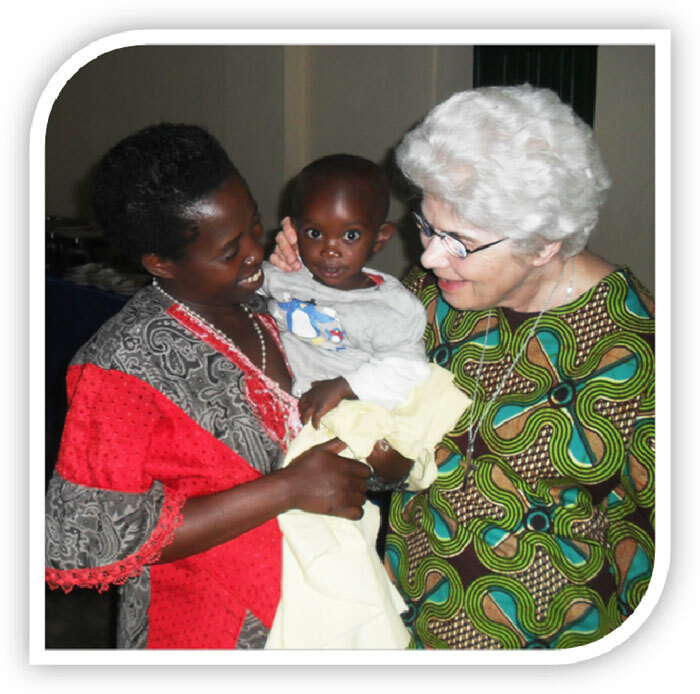 In June 2014, I was in Rwanda, with 14 alumni from the Institut de formation humaine intégrale de Montréal to offer a formation session to 40 couples from Byumba diocese. We were in that region where the first battles leading to the genocide flared up in 1990. 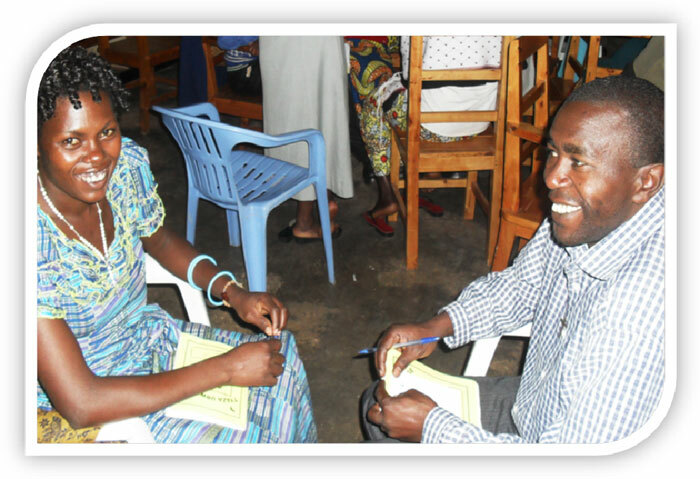 All the couples were present to complete their third session aimed at preparing them for a peace mission. 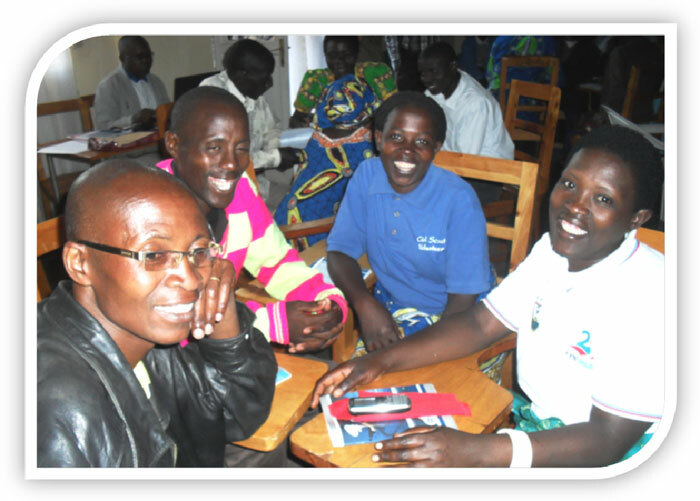 They began their training in 2012 to become “peace couples” and to build “peace families”. Their success is now stimulating their neighbors to also become Peacemakers. The two first training sessions were brief (two and three days respectively) but the first one in 2012 was decisive. Fifty couples began researching and collecting significant experiences that contributed to building their own families. As they identified their strengths, they shared their thoughts about what brought them together, their common goals, the initiatives they tried to promote, the delays, their choices, their sacrifices and the obstacles they worked through. Their love was shaped and brought to light through their actions. These couples were now amazed with one another where frustrations used to drive them apart. These couples’ children suffered the consequences of the tensions between their parents. Using key elements from human development theory, we helped them see their reality differently. A lot of honesty and transparency was required to be able to admit that culture can contribute to child abuse. Also, certain behaviors may be imposed when totally different actions could be developed. Parents started changing their behavior towards their children when they started to understand the underlying causes of their reactions. But these parents also needed to grow as couples. They had to find harmony in their love for each other and with their sexuality. To love someone is to consider him or her as a person. This may represent a huge challenge with regards to sexuality. Instead of living lives led by anger, these people learned to control their emotions and their sexual drives, which can create a lot of tension when misaligned. In 2013, during the second session, they worked on their inner selves and grew to become Peacemakers. Their relationships as couples evolved to a point where families and friends asked if this change was due to medication! Parents who achieved peace raised their children differently. Children were appeased. These Peacemakers are now in great demand. And today, more and more peace families are developing in these sensitive regions. 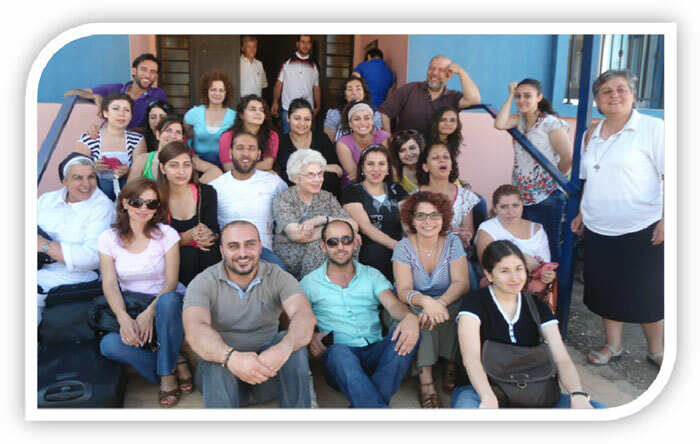 Towards the end of July 2014, I was in the Bekaa Valley taking part in a “Peace Bridge-Builder” session. I was with 37 Syrians, mainly from Damascus and Homs, and 10 Syrian educators, all refugees in Bekaa camps: a group of 47 Syrians, of various political and religious beliefs. What brought these refugees together? These people could have been enemies. But now, all they wanted was to break down the walls between them and build bridges. To achieve this goal meant facing some big challenges. Undoubtedly, there are various political views, but above all, they are strangers to one another. What does he/she think when I speak? What does he/she really want? What will he/she do with what I say? 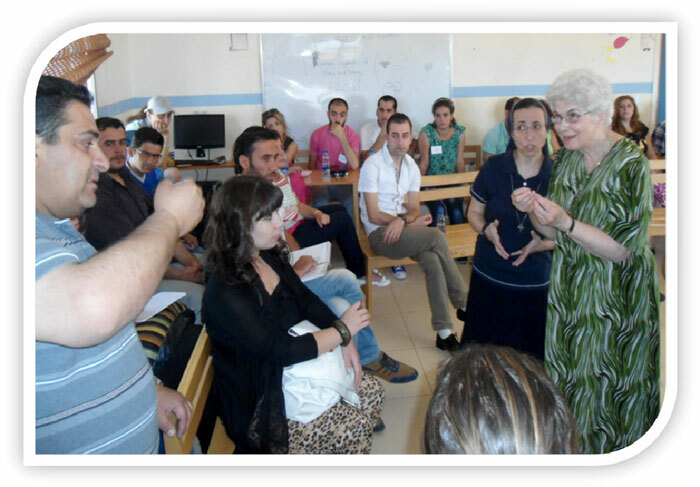 The educators in the Bekaa camps started to work in depth with one of our former Lebanese students, Micheline Lattouf. Together they learned to build peace bridges. They developed a program called the “Peace Education Program”. Their objective was to train school children to return to Syria as “Little Peace Bridge Makers” rather than as warriors. At the outset, albeit tired and tense from all the fighting in their country, the 37 Syrians from Syria discovered the importance of first recovering peace within. Day after day, participants kept making “expeditions” towards each other, which is paramount to becoming a Peace Bridge Builder. What I mean by making “expeditions” is choosing to approach people one would never otherwise be drawn to; this is how one learns to communicate with strangers and enemies. If I hear a story of how he or she has helped someone else, even if the person telling the story is of another religion, would I still fear this person? These experiences are so simple they may go unnoticed. And yet, this is how, by listening, that we learn to break down walls and build bridges. The Syrians were able to see beyond their differences; they interacted and recognized each other as equals in all their humanity and dignity. I invite you to nominate individuals or groups for the Public Prize for Peace. As the list of individuals and groups develops, so will the assurance that peace is still budding in the world despite the headlines highlighting conflicts, wars and violence in all shapes and forms. The world needs happier news. The day we learn that peace has made its way in all villages in all countries, then, and only then, will we be able to say: mission accomplished! Marie-Marcelle Desmarais is recognized as the originator and founder of Bâtisseurs de ponts de paix (Builders of Peace Bridges) an educational program that trains hundreds of people acting in the name of peace on every continent. She has offered more than 250 sessions, seminars and conferences in more than 40 countries, where she has been invited by people and organizations involved in important challenges in Lebanon, Syria, Egypt, Rwanda, Haiti and by former students of l’Institut de formation humaine intégrale in Montreal, Canada; where she has been director since 1984.